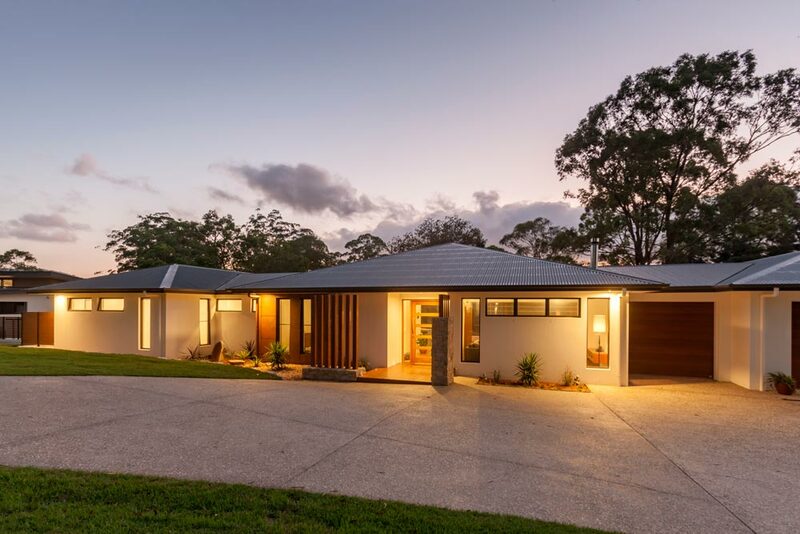 “We are delighted that we appointed James and the team at Highlife Homes to build our home. 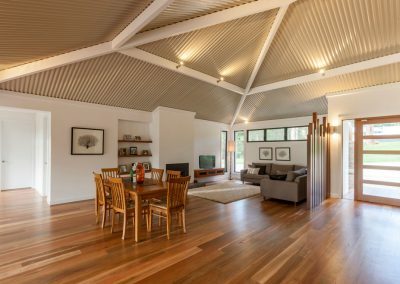 They worked with us each step of the way and seemed to take as much pleasure in building our home as we did along the way. 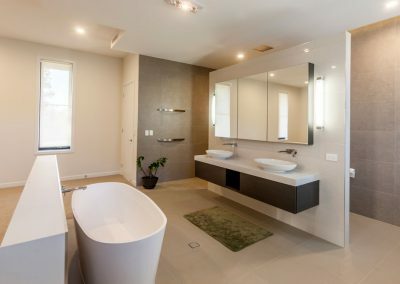 We would absolutely recommend them to anyone who is looking for a quality product and proactive advice during the build which in our experience is a rare thing in the building industry. 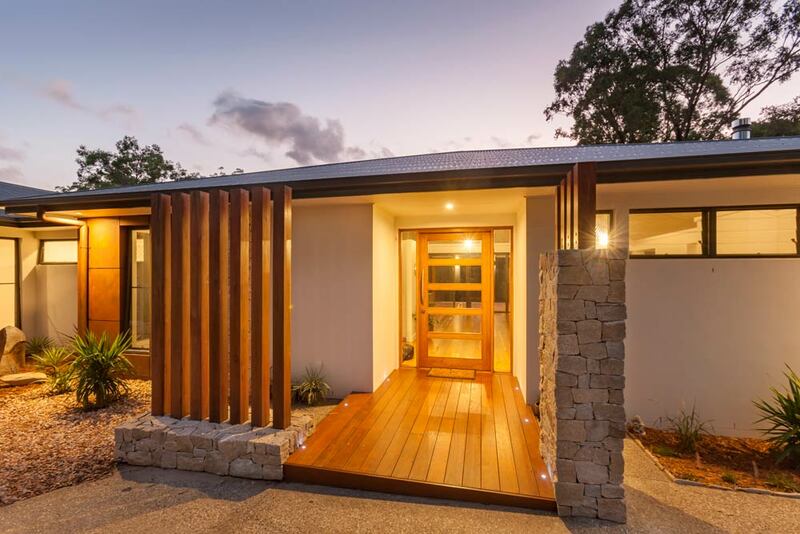 After buildng this client’s neighbours home, we came highly recommended for high quality, attention to detail and excellent customer service! The clients’ vision for this large single storey home reflected their unique personal style – an eclectic mix of contemporary refined fixtures with bold rustic accents. 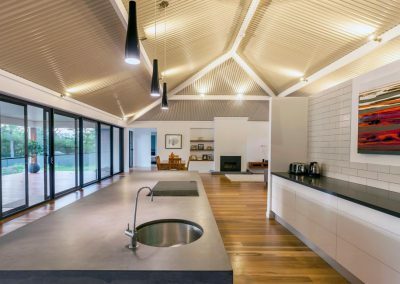 The final outcome is a high-quality, truly custom home that suits the clients’ lifestyle and personal style in a location that melds urban and country living so well. 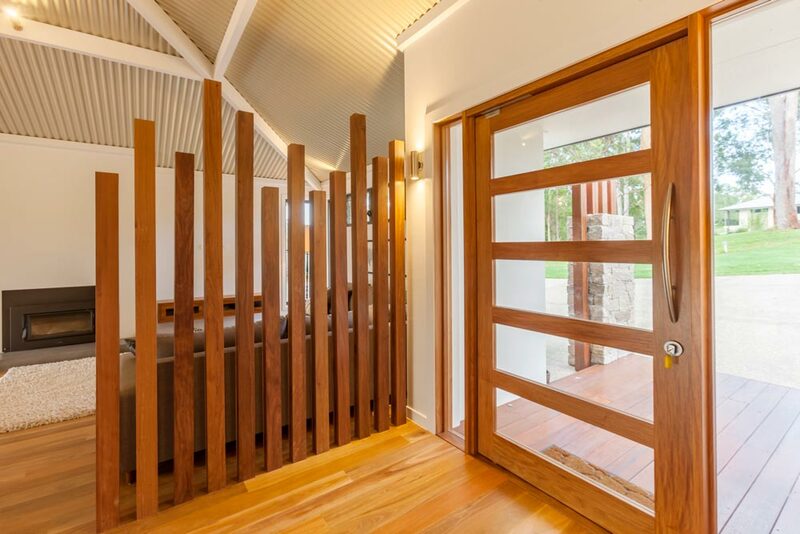 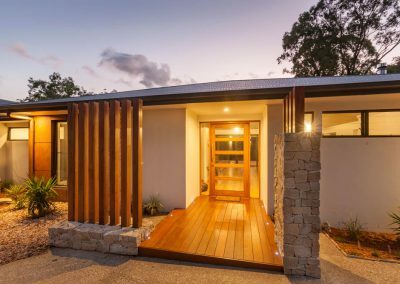 The home consists of a lot of natural products, from spotted gum hardwood timber floors to stacker stone and recycled timber posts. 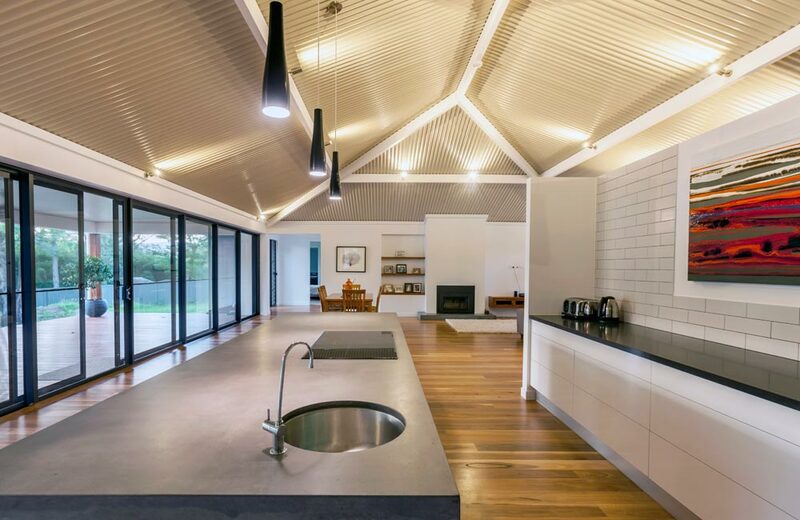 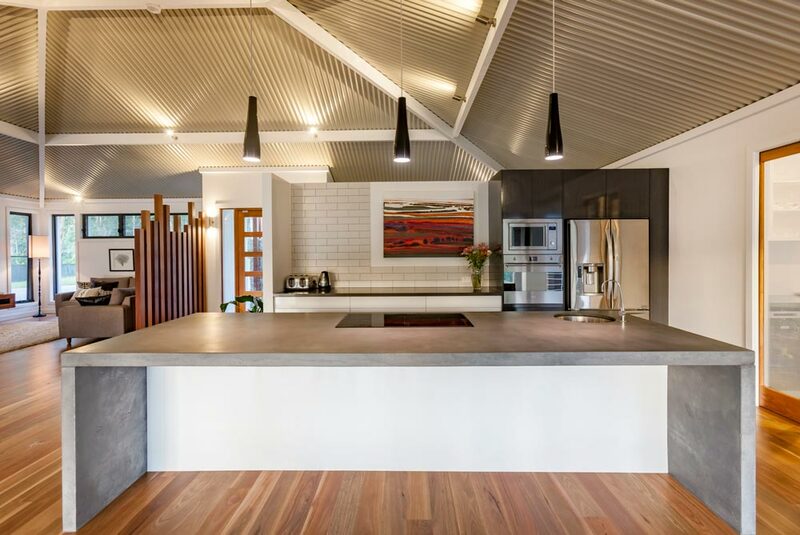 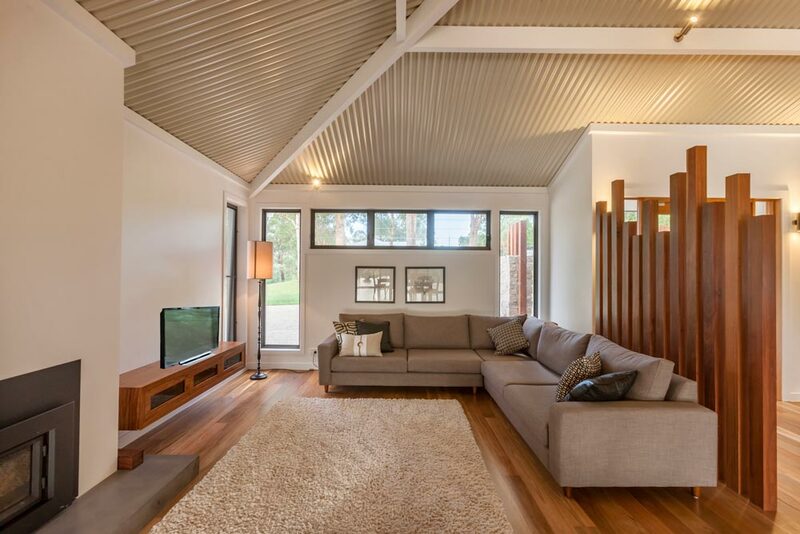 A rust effect cladding is featured on the exterior walls and fits well with, perhaps the most awe-inspiring feature of the home, a corrugated ceiling giving the impression of large exposed beams supporting the outer roof. 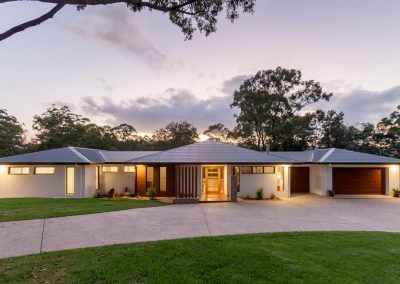 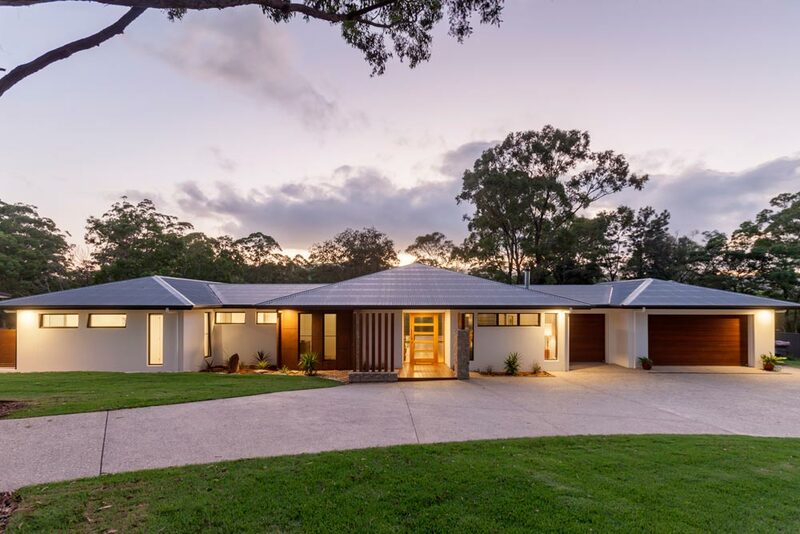 Both features bring a humbling country feel to the property that is quite perfectly located on the beginnings of the hinterland in Mudgeeraba close to a small picturesque creek. 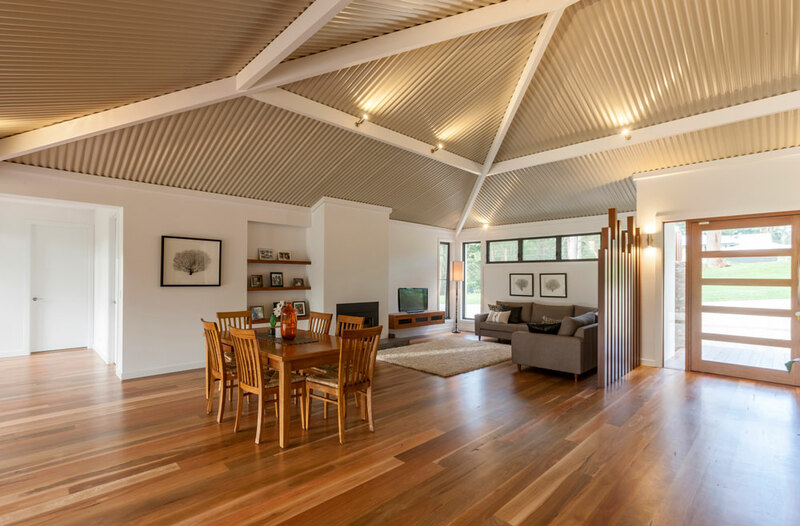 On the corrugated ceiling James used minimal fixings to make it look as seamless as possible. 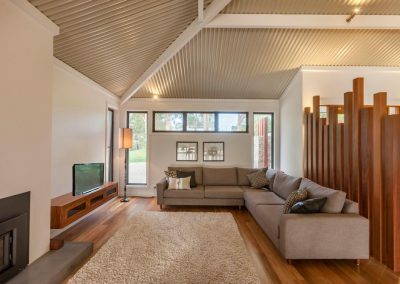 These geometrical lines of the roof beams line up in symmetry but also interesting illusion of odd lines depending on where you stand in the living room. 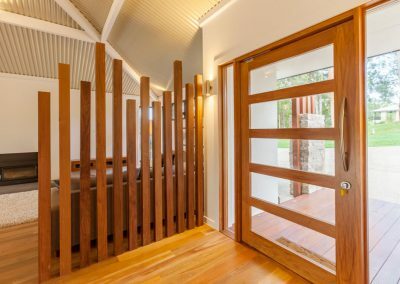 The attention to detail and unique build aspects of the job continue throughout. 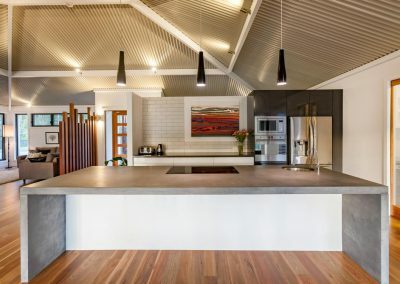 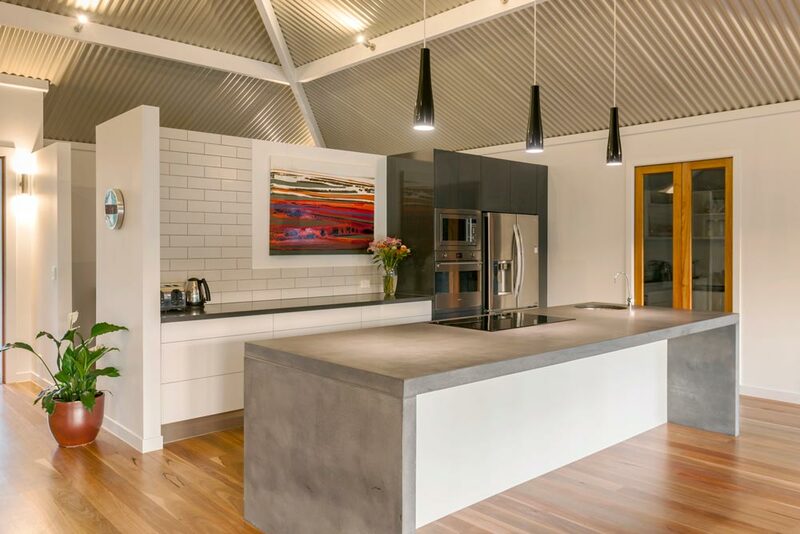 In the kitchen sits a large polished concrete island benchtop with waterfall ends, the rough texture of which is elegantly contrasted with the dark gloss cabinetry and the luxury stainless steel appliances. 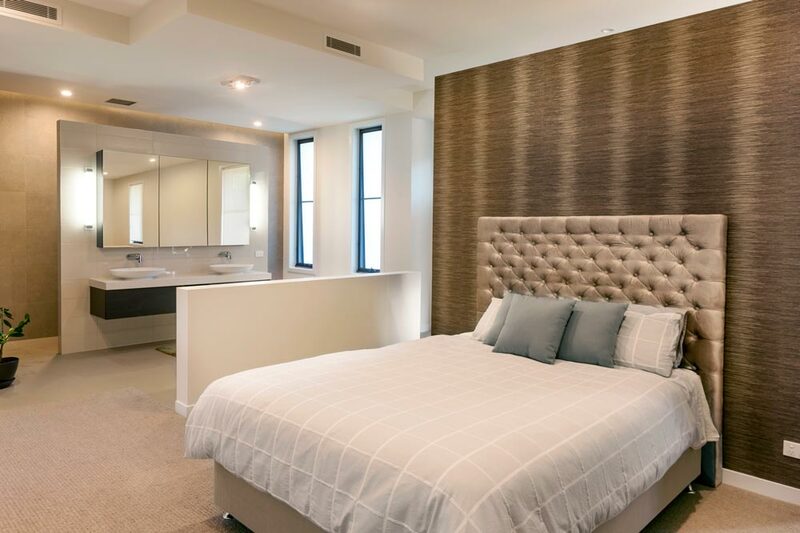 The open plan master bedroom, luxury ensuite and spacious walk-in-robe, is sophisticated retreat for the parents. 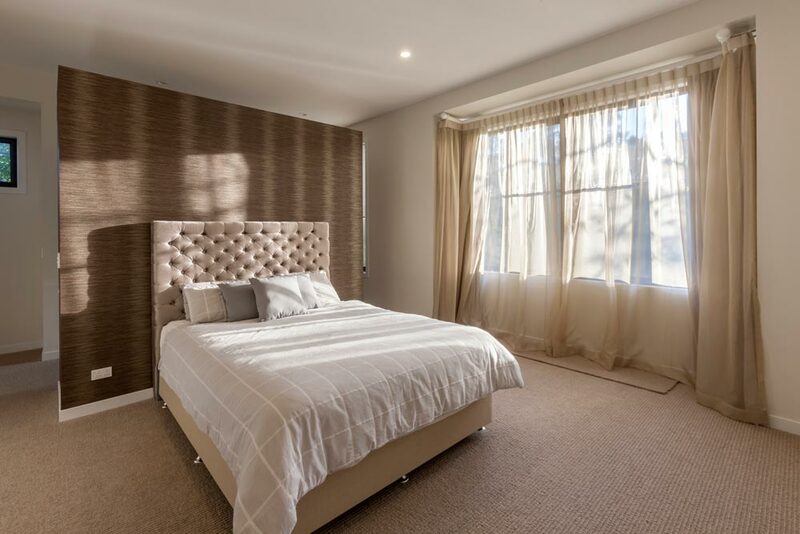 The ambient recessed lighting creates a luxury feel at night, and by day the large windows of the master bedroom bring in plenty of sunshine as well as a view of the adjacent woodland which makes you feel like you’re a part of nature.